To Aust on the "Ships starting with A" page. Armament: 2 double Hotchkiss 0.303, 2 P.A.C. rockets, and a 3" gun. Built in Stockton-on-Tees 1920. Previous names: H H Asquith until 1932, Nailsea Court until 1936, Nailsea Manor until 1937, Danybryn until 1938, Lasta until 1939. While she had the name Lasta she belonged to the Yugoslavian company Jugoslovenska Plovidba DD (Yugoslavian Navigation Co.). According to the external page that I've linked to above, she was delivered in in June-1920 as H H Asquith to Williams & Mordey, Cardiff. From 1932, sailed as Nailsea Court for Nailsea S.S. Co. Ltd., Cardiff, renamed Nailsea Manor in 1936 for Nailsea S.S. Co. Ltd. ( E.R. Manag), Cardiff. From 1937, as Danybryn for Brynymor S.S. Co. Ltd. (Ambrose, Davies & Matthews), Cardiff. Owned from 1938 by Jugoslavenska Plovidba D.D., Susak, Yugoslavia, renamed Lasta, then as Aust for D/S A/S Carolvore (Lundegaard & Sønner), Farsund from 1939. Norwegian Victims of Thor - Details on her final fate. Merchant Marine Prisoners of War - Includes crew list when captured. Previously traded in neutral waters. According to Page 1 of the archive documents, Aust was in Santos when war broke out in Norway on Apr. 9-1940, having arrived there that same day from Buenos Aires. Her 1941 voyages also start on this document (it looks like she spent a long time in Calcutta that spring) and continue on Page 2. On Oct. 23-1941 she's listed in the slow Sydney (C.B.)-U.K. Convoy SC 51, bound for Leith with general cargo, arriving there, via Loch Ewe and Methil Roads, on Nov. 18. Follow the link for further details; other Norwegian ships also took part. There's a note in the Advance Sailing Telegram for this convoy indicating she had originally been scheduled for the previous convoy on Oct. 17, SC 50. It'll be noticed, when going back to Page 2, that she later spent a long time at Tyne; perhaps she had had some problems that needed to be repaired? In Jan.-1942 we find her in the westbound North Atlantic Convoy ON 60, which originated in Liverpool on Jan. 26 and arrived Halifax on Febr. 15. Aust, however, was bound for New York, where she arrived on the 18th, having sailed from Loch Ewe on Jan. 26. This convoy will be added to an individual page in my Convoys section; in the meantime, the ships sailing in it are named in the section listing ships in all ON convoys. Several Norwegian ships took part, namely Fagersten, Henrik Ibsen, Inger Elisabeth, Ledaal, Lisbeth, Rena (the latter 2 returned), Selbo and Suderøy, all listed on this website. More information on them can be found with the help of the alphabet index at the end of this page, or via the Master Ship Index. Aust departed Pier 26 in Brooklyn with war materials on March 5-1942 for Bombay via St. Thomas for bunkers, arriving St. Thomas on March 13 where she took on 360 tons of coal. Due to lack of water there they were not able to take on board enough for their voyage to Capetown, which was their next designated stop. She left St. Thomas on March 14, and en route they discovered that they didn't have enough coal either, so it was decided to stop at Pernambuco for more coal as well as water, arriving there on March 27, departing for Capetown the following day - again, see Page 2. On Apr. 3-1942 she was stopped by the German auxiliary cruiser T/S Thor (HSK IV SCHIFF 10). The entire crew was taken on board the raider and Aust was sunk by explosives placed on board (21S 16W). 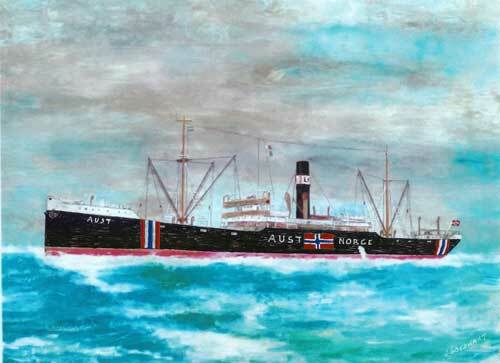 Please continue to my page about Norwegian Victims of Thor for a lot more details on the capture of Aust (as well as info on Thor) and what happened to those on board - includes an excerpt from Lise Lindbæk's interview with the 1st mate in which he tells her about life on board Thor, Regensburg and Ramses (from "Tusen norske skip"), "Life on Dresden and the journey home", and information on the other Norwegian ships captured by this raider. A crew list at the time of sinking is available on this page. This website states that Aust's crew members are listed in Yokohama War Cemetery (it's a section of Children of Far East Prisoners of War). Back to Aust on the "Ships starting with A" page.